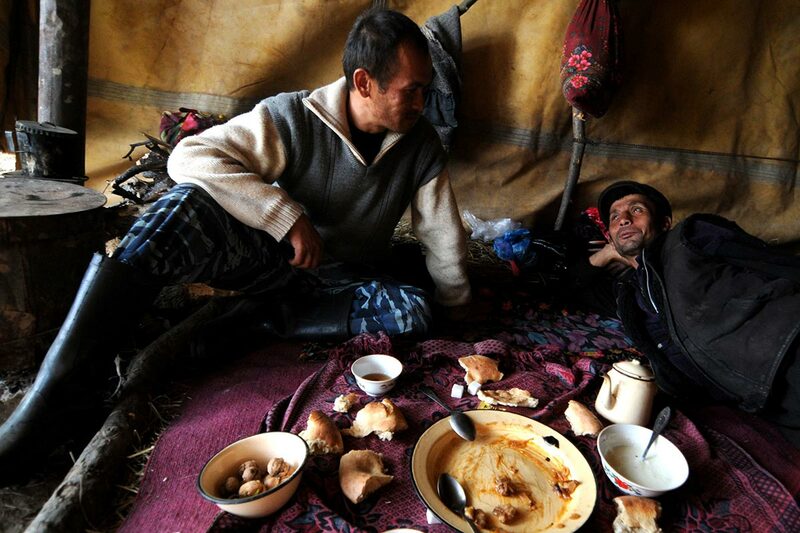 Every fall, residents of the small town of Arslanbob, Kyrgyzstan, leave their homes en masse to live in tents in a nearby forest, where they spend a month collecting nuts. At the foot of the Babash Ata Mountain, more than 2,000 metres above sea level, you can see small tents made of wood and a variety of waterproof materials dotting the forests, far removed from the beautiful, ornate yurts to which travellers are accustomed in Kyrgyzstan. Children’s voices echo from the hilly green forests under snow-white peaks. The forest seems to be speaking a strangely human language. When an outsider ventures into the forest, from one tent to another, they will discover the fascinating story of this unusual region. Walnuts have a unique origin in the forests of southern Kyrgyzstan. Legends say Alexander the Great, having conquered this region in the 4th century BC, decided to take some local nuts home with him. “On the way back to Greece, some nuts fell to the ground through holes in the bags. Thus new forests emerged throughout the Orient,” I am told proudly by Ahmed from Arslanbob. 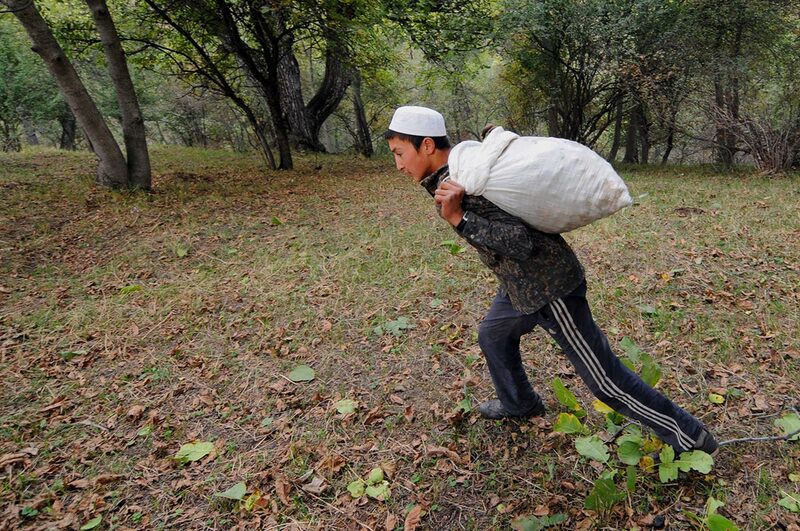 The town is Kyrgyzstan’s nut-forest capital. Parents rely on their children to help harvest walnuts each fall. From ancient Greece, the walnuts spread to gardens and orchards around the world. “They were supposed to be called ‘Arslanbob nuts,’ but they were given a Greek name,” he adds significantly, while drinking tea placed on a tablecloth spread on the ground before his tent under a walnut tree. Ahmed’s wife is arranging food produced in the forest on another colourful tablecloth, as is typical in the region. There is sweet cream, so thick you could stand a teaspoon in it, and sweet cottage cheese, in which you can dip traditional Central Asian bread called lepyoshka. “We baked the bread the day before yesterday, for us and the neighbours,” Ahmed says while cracking nuts. He then places them on the tablecloth crushed and unpeeled, loudly asking his wife when and who would bake bread in the clay oven for four neighbouring families. Meanwhile, another woman stands close to the oven, roasting ram meat. 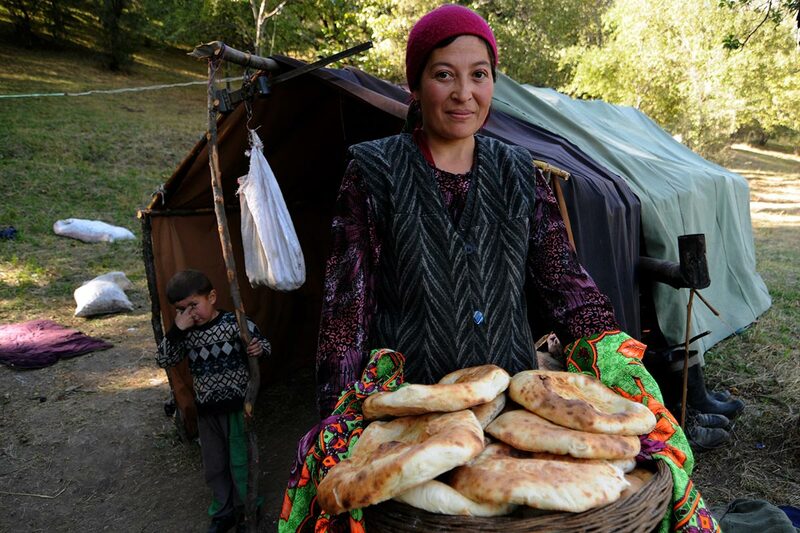 Ahmed’s wife with a basket of lepyoshka bread. But this quietly authentic way of life is not without its threats. The steep uphill path through walnut forests has been trodden by cows, donkeys and people. Grazing animals brought from the city can be seen all over the forest; while they’re necessary for locals’ survival, they also eat much of the forest’s natural vegetation—including germinating walnuts, which makes forest restoration difficult. But even if the animals were under control, industrialization and urban sprawl pose their own problems. After the collapse of the Soviet Union, the size of ​​forest nurseries greatly diminished. The fields, which were once used to cultivate small gardens to supply 1,000 hectares of forest, were now disappearing under houses of the expanding city. You’ve got to shake down the trees any way you can. On Ahmed’s square tablecloth, there are no candies yet. They don’t grow on trees like walnuts, or fall from the crown of clouds. Ahmed sends his son to a shop to buy them. 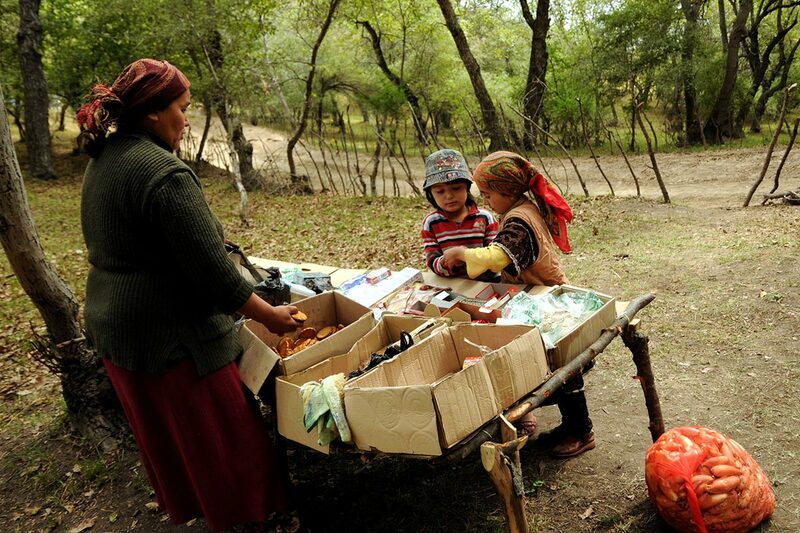 The town is far away, so everyone shops at a makeshift store run by a fellow family living in the woods. Under the canopy of nuts in a provisional shop, a woman offers sweet sodas, candies and cigarettes on a table. The son pulls out a bag of nuts from his backpack. The businesswoman weighs it and gives him a small bag of sweets in return. One kilo of shelled walnuts equals two dollars. The shop in the woods. “People rarely pay cash,” the businesswoman says with a smile. “Just collect the nuts from under a little tree and then they have something to drink or eat in their shelters.” At her family’s tent, bags of nuts are stored, ready to sell at a larger city bazaar. Ahmed’s son walks along the path through the great walnut trees with the backpack on his shoulders. Ahmed later explains that teachers understand how children are needed at this time of year in the woods. 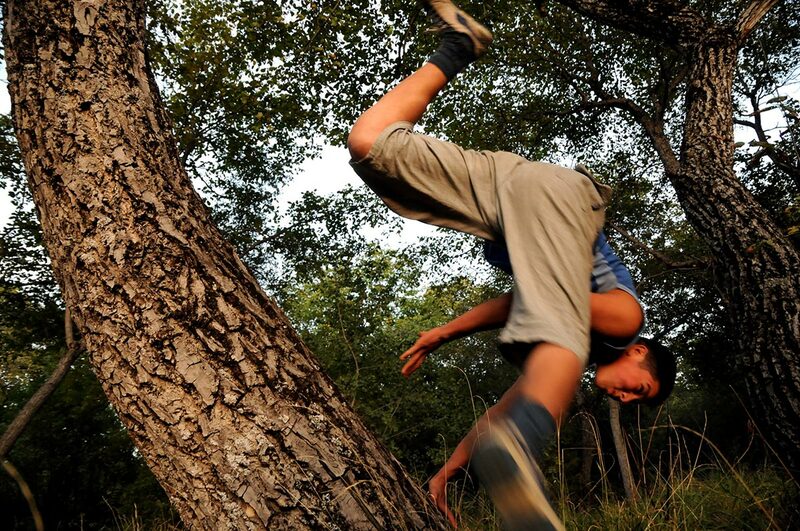 Young boys, agile and strong and able to climb high into trees, shake down nuts from the branches to the ground. According to Sattor, the former forester, “Yes, sometimes the youngsters would fall from a tree and an accident happens.” He now prefers to earn money by renting rooms to tourists. Under the walnut tree crown, a mother and two daughters are picking nuts, stooping to pick up the green walnut pods by the handful and throwing them without haste into plastic bags. To take buckets and ladders on donkeys into the forest is an unnecessary burden. In the shadows of the trees, walnut pickers are strolling here and there, looking for what the young boys had shaken down. Forest food: bread, walnuts and thick cream. The bricklaying profession is the most prominent in the region. New buildings and additions are being built constantly. “Young people are getting married later,” Ravshan explains. “They are already like you—first find the money, then the wedding. The birth rate is falling.” He mentions that in his country there are houses already built by families and young men, waiting to find housewives to help fill them. Nearly half the population of Kyrgyzstan is under the age of 24. Ravshan’s twins are coming down on a bicycle from the slope among the trees, braking with their pedals on the damp walnut leaves in front of their waiting father. They unload barrels of water from the carrier. “It’s enough for one day. It is water just for washing hands, making tea, flushing the toilet, and washing dishes,” says Elmira, Ravshan’s wife. In her kitchen, a clay-oven fire is constantly heating a smoking kettle, which contains a ready supply of hot water for serving tea or washing dirty tools. Families rely on their kids to harvest the nuts. Kyrgyzstan is full of water, most of it coming from the Central Asia region. Above Arslanbob’s horizon of green walnut forests, snowy peaks rise. From these peaks spring the wild River Arslanbob and dozens of streams of pure water flowing through forests and meadows, breathing life into the landscape and its inhabitants, both animals and humans. 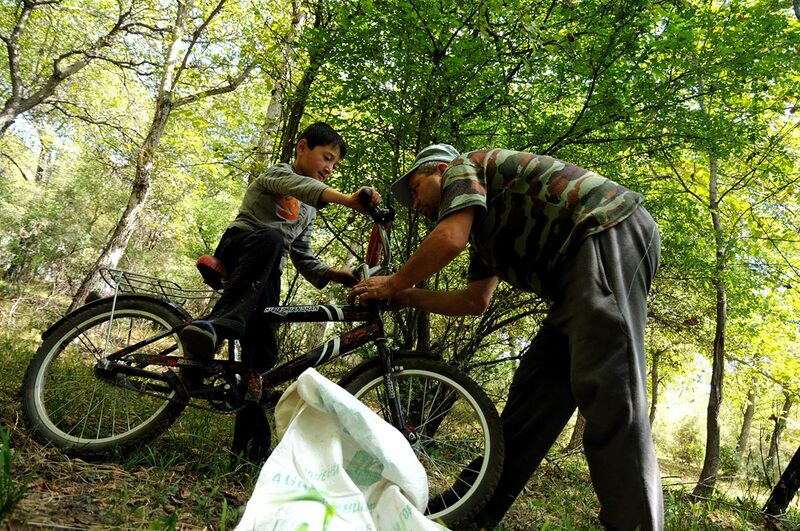 A father carefully tightens the loose handlebars on his son’s bicycle, and then they begin to gather nuts, moving from tree to tree. The hired nut pickers haven’t shaken down the entire harvest, so there are enough nuts blown down by the wind to keep the family supplied. A father fixes his son’s bike. The Kyrgyz state is the only owner of this land. The forestry department is responsible for maintaining the forests by controlling tree cutting, vegetarian planting and land tenure. Families typically rent one-half to three hectares of forest land for the nut-gathering season. A family can collect anywhere from five to 70 kilograms of walnuts a day. How many nuts fall from the tree, and a family’s annual revenue, depends on several factors. The most common obstacles are late spring frosts, flowers or a lack of rain, which has an impact on the crop planted in the fields. “The collection of nuts is a very unreliable income. 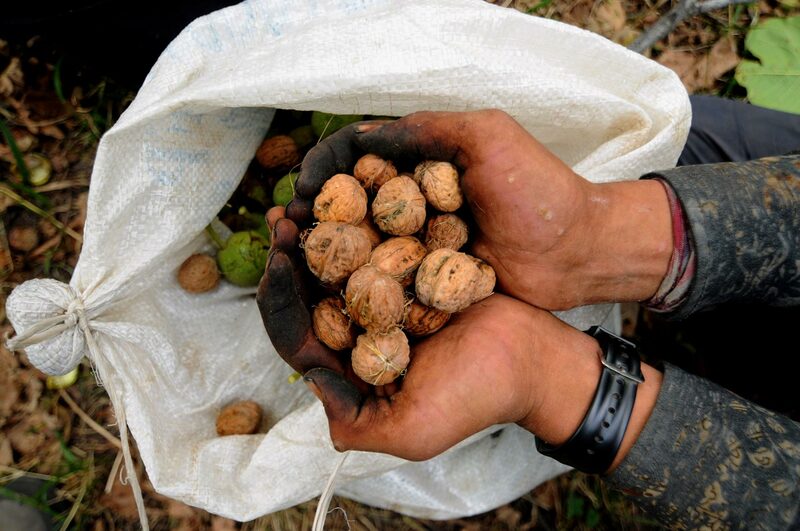 In 10 years, there will probably only be three or four good walnut crops,” says Sattor. 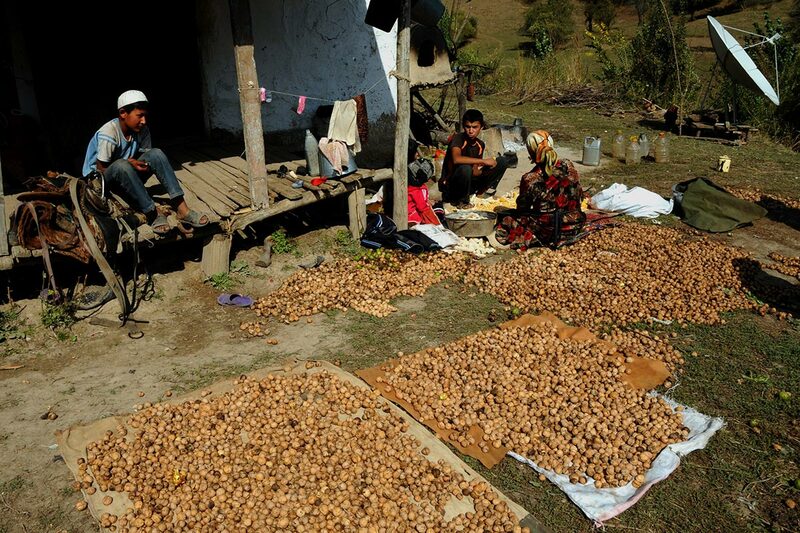 However, even in years of poor harvest, walnuts create an important financial source for poor families from Arslanbob. Their incomes are low, and employment opportunities even lower. “The breakup of the Soviet Union 20 years ago has greatly reduced employment opportunities in the region,” Sattor explains. “Nothing was left, other than to go to the woods and fields to take care of the families.” Every year, more people are working and using up the resources from these unique forests. No one knows how long it can last. Winter is a dangerous time in Arslanbob. Locals need to heat their homes with wood, as there is no gas pipeline connected to the remote town. Because the trees are so valuable, people are only allowed to collect dry twigs and dead branches from the mountains and forests. Arslanbek, Arkram’s eldest grandson, left for the mountains immediately after finishing apprentice school. He left his girlfriend a month ago, and now his axe can be heard throughout the whole forest. Occasionally, he’ll accidentally strike a living branch, and then must hide the evidence. “Everyone does it,” Arslanbek says. He can distinguish, just by listening, whose axe is hacking away throughout the wide valley, where heavy chopping can echo as far as two kilometres away. It is the sound of every family living here, trying to survive. 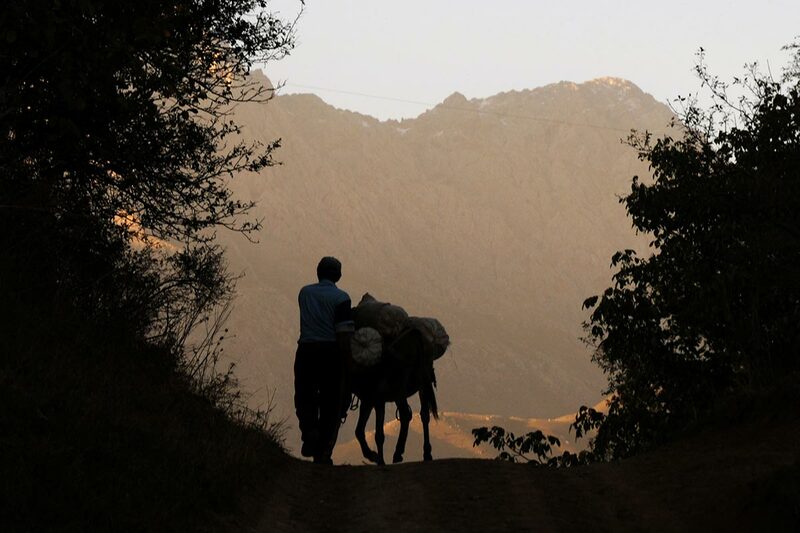 They create a vast community spread over thousands of hectares, surrounding and sustaining the small town of Arslanbob. After studying philosophy and history at university, Martin Balaz now works as freelance photographer with a focus on social and environmental photography, mainly in Central Asia and the Middle East. In addition to his magazine work, he's had and solo and group exhibitions. He lives in Slovakia.